Palm Sunday marks the beginning of Holy Week as well as the last Sunday of Lent. You could also say it is one of the more distinctly Catholic holidays celebrated by the Church in all corners of the world. 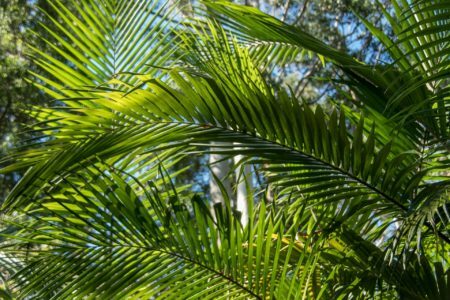 Today, there will be a procession of palm fronds in parishes big and small. A ceremonial blessing will soon follow during the course of the mass. Depending on the locale, you can either bring the palms over for your own altar or have them solemnly burned to be used for next year’s Ash Wednesday. Most importantly, however, is that the account of Jesus’s arrival in Jerusalem is full of symbolism about His mission. Particularly, His humility and the contrast of His Kingdom with that of the worldly powers of Roman-occupied Israel. A donkey instead of a horse. Jesus’ arrival on a donkey represents the first stark contrast to worldly grandeur. Whereas kings arrived in fine horses, Jesus rode into the city upon a humble beast of burden. Like the donkey, Christ is the bearer of burdens and wishes only to serve for the glory of God. He arrived in a manner that did not elevate Him above His followers but marked Him as being among them. Palm fronds instead of banners. Conquerors such as Caesar (and other rulers before him) are often heralded by banners. But for Christ, these were replaced by the fronds that are now used to commemorate the start of Holy Week. Like the olive branch, the palm branch was also held to be a symbol of peace. Whereas other rulers subjugated others through force, Christ seeks only to bring peace and fellowship for us all. Twelve disciples instead of an army. Lastly, let us not forget that the only entourage Jesus had were none other than just his twelve apostles. He did not arrive with battalions behind him or weapons of war. Instead, He arrived with common men who did not appear any different from the people who were shouting Him praises or wondering who He was. Furthermore, He recognized them and loved them as fellow man and not as mere tools for ambition. Put it all together, Christ’s triumphal arrival in Jerusalem really emphasizes His title as the Prince of Peace. With only a donkey for a mount, palm fronds for banners and an entourage of laypeople, Jesus was proclaimed a King by all those who have heard of Him. 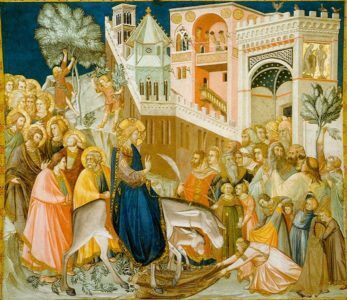 The story of Palm Sunday demonstrates the sharp contrast between the Kingdom of Heaven with the warring, conquering kingdoms on earth. From the time of the Babylonians, the Romans and all the way to modern times, people have sadly chosen to glorify violence and warfare as a means to expand their worldly kingdoms. As Christians, we are called by Jesus to take the radically counterintuitive approach and embrace peace whenever possible. One of the most important lessons in Lent (and in Christianity as a whole) was that Christ did not come to the world to establish an earthly kingdom. He came to the world as a sacrifice for the salvation of us all. In principle, it was the complete opposite of the ethos of many ancient emperors and rulers, who built their kingdoms based on conquest. As Christians, use Palm Sunday as an opportunity to celebrate peace instead of building up earthly kingdoms through conflict. The symbols of Christ’s triumphal arrival in Jerusalem can serve as your guide. 1. Do I present myself like I’m on a war horse? Do you go about with your head held a little too high? Remember the lesson on humility from Christ’s choice of a steed. Like Christ, we are here on this earth to serve not ourselves but God and His Glory. Jesus was the ultimate model of servanthood and presented Himself as such to disciples and sinners alike. 2. Do I announce and parade my intentions and achievements? The banners of conquerors were often meant to both intimidate their enemies and indicate their intentions to take over. This is another habit of pride and is really not very Christ-like. This goes even for spiritual pride, when we use items like the palm branch as if to brag about our religion instead of reflecting upon its meaning. Use Palm Sunday as an opportunity to focus on God rather than parading yourself. 3. Do I use others as accessories to my pride? If there is one thing Christ never did but conquerors always do, it is using others as tools for their ambition. How do you see your fellow human beings? Do you see them as the people that they truly are, or are they merely like a standing army for you to use for the sake of intimidation? The Christian path to peace is not merely a path against aggression but the aggressive use of people as if they were only pawns.